I currently have a tyre inflation kit in my 2016 XF and wondered how easy it was to switch to having a space saver spare. I know I would need a wheel and tyre along with a jacking kit but is there anything else like new boot mat/carpet etc. It's easy! Go to your local dealer, open your wallet and "Help Yourself". They will extract the thick end of £700 and provide you with a new boot mat, spacesaver wheel, large chunk of foamed polystyrene and a jack. I had a spare spacesaver from my X type, so I only needed the other bits, nearly £400. Worth it though. I have a full size matching alloy for my s type, and when I bought SWMBO a Toyota Yaris Hybrid it had a tyre inflator and a can of gunge. Ten minutes on eBay and a matching alloy wheel costing £80 was delivered next mooning. Dunlop tyre fitted for £100 fitted later that day. I already had a wheel brace, and a jack from eBay collected from the seller a few miles away the day after. All for £200. No chance of putting a full size spare in an XF. They put the battery in the spare well. That is a minus point for the XF. When I say that, I remind myself that I have not had a puncture since 2001. But the spare wheel does give me peace of mind. And that's the problem Peter. Last time I had a puncture was going round the magic roundabout in Hemel Hempstead in 2003 when I ran over an angled piece of iron which sat up and ripped one of my side walls.... Before that, must have been way back, mid 90s or before. The spacesaver was fine for getting me to the hotel and to a tyre place the following morning. One of my Merc MLs had LPG so I had no spare wheel at all as the LPG tank was in there and I carried a Slime Emergency Car Tyre Repair bottle, but never had to use it. 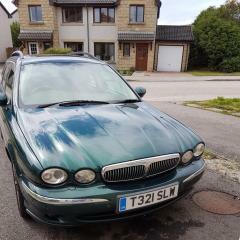 My Jag came with a full sized alloy but really, for me it's just extra weight to cart around but I leave it in there (with the bottle of Slime!) as I have no room for it in my garage which is filled with other junk If I did have a puncture I would probably use the Slime as the spare is too heavy and awkward to manhandle in and out of the boot! Another issue which divides opinion; personally MOH and I prefer to have a full size on the basis that if you have a tear/complete blowout etc., a can of Slime or whatever is not going to cut it (no pun intended). 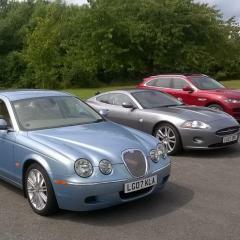 Our S-type has a full size alloy, as does our XJ8. Naturally, the XK has a space saver as the front and rear tyres are different sizes, but at least we have a spare. The last time we had a flat was 2012, a debris induced rapid deflate on the M25 near Cobham, this in our pre-Jaguar days. Before that, the nearest we got was back in 2005 when some n'er do well pinched the spare from underneath my "jelly mould" Picasso. I felt very deflated at the time.......doh. I've upgraded my XF Sportbrake to space saver spare wheel for £170 (ebay) use it also when rotate my tyres. One of my sons has a space saver on his x-type estate, which he had to use several times last winter. He was advised not to exceed 30 mph and to get a new type for the offending wheel ASAP. It says on the wheel label not to exceed 50mph. What's the "offending wheel" means? Space saver wheels must have improved since my son's 2006 x-type. The "offending wheel" is the one that got itself into a bad pothole on the road from Lichfield to Fradley. P.S. I should have said "Welcome to the Club" -- I hope you enjoy the Club as well as your car. One of the first things I did was source another alloy wheel and relegate the spacesaver to the shed. Hi ,Please can anyone advise me on the suitability of fitting a spacesaver spare wheel to my 2018 Jaguar XF.Prior to buying on EBay I noticed the battery is fitted in the spare wheel well,and I can’t see anyway a spacesaver would fit.Has anyone else encountered this problem.Or is there another solution ie repositioning the Battery? Hi I have only just joined the forum but have some info. 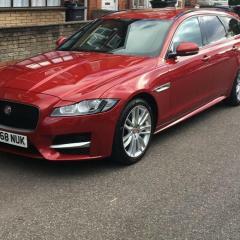 I have a 2018 2.0 diesel XF. The battery is in the spare wheel well, as mentioned, however I have bought a spacesave type spare wheel from ebay for £60 delivered. I have a jack and wrench so no problem there. I removed the polystyrene that shrouds the pump and gunk kit and the wheel fits in. The wheel sit proud approx. 1.5" so I have put some wood along each side of the boot channel and the boot cover not sits flush. The wheel is secured by some 6mm screwed rod and a small baton and washer. I have had punctures that will not be fixed by the reinflation kit plus most main tyre dealers will not repair a tyre that has been filled with the gunk in these kits and will insist you buy a new tyre. Some independent tyre garages will however, but not all. Sounds like a con to me That's why I want a spare wheel. Hi Chris, and welcome to the club. When I bought my s type 6 years ago, I was able to get a full list of all the optional extras that the first owner had fitted in the factory, which was very interesting. One of the items was a Spare wheel on a matching alloy. The s type also has the space in which to store it. Luckily I have never had to use it -- keeping fingers crossed! Your ideas of how to store a space saver in the boot are very useful to those others who would not want to rely on gunk. When my wife got her Toyota Yaris there was a full gunk kit in a nice polystyrene block which fitted into the spare wheel space. This is now hanging on the wall in the garage, and within three days a matching alloy via eBay, and a matching tyre from Halfords were in the wheel space. Peace of mind is worth a few bob!